The slide guitar ragas of Grammy-nominated Debashish Bhattacharya are deeply grounded in India's musical traditions yet profoundly innovative. Combining revolutionary reinvented guitars with a boundary-bending melodic and rhythmic approach, Slide Guitar Ragas From Dusk Till Dawn is an album of sublime and joyous musical meditations. One of the uniquely poetic features of Indian musical tradition is the attachment of ragas to distinct times of the day and night. From the first crack of sunshine at dawn until diminuendo into darkness at dusk, and from twilight to the start of the new day, every fragile moment of earth's daily passage is linked to a specific raga. It is believed that the melody and modality of each raga is at its most powerful when played during its allotted hour. 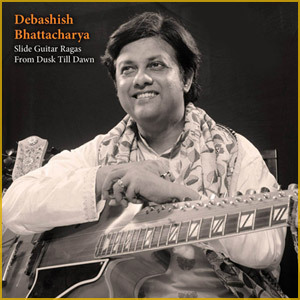 On Slide Guitar Ragas From Dusk Till Dawn Debashish Bhattacharya guides listeners through his sensitive exploration of raga rotations. Debashish's apparatus is his self-designed chaturangui guitar. The chaturangui is a Hindustani adaptation of the slide guitar with six primary strings, four supporting strings, two drone strings and twelve sympathetic strings creating tonal similarities with the Indian sitar. Debashish plays his instrument with a three-finger picking style derived from ancient practices of veena playing. The veena is an ancient predecessor to the modern sitar, distinct for its resonating gourd chamber, bridge and long neck. 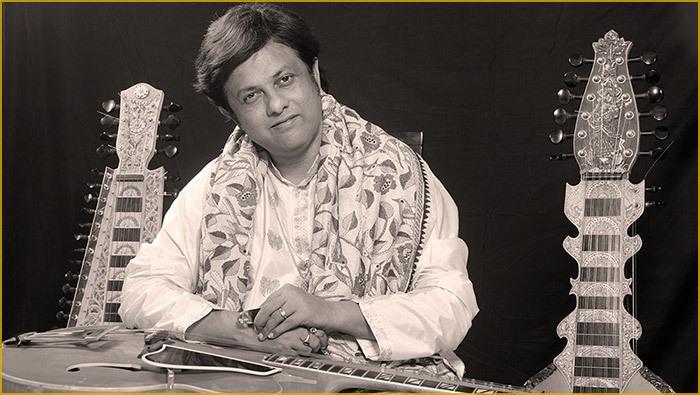 Debashish's instrumental influences include sarangi player (and singer) Ustad Bade Ghulum Ali Khan and sitar maestro Ustad Vilayat Khan. Later he formed a close relationship with Jodhpur-born guitar pioneer Pandit Brij Bhushan Kabra. Debashish now considers Kabra his musical guru. Debashish plays 'Roshni (The Light)' on Kabra's custom-made Gibson S400 guitar, top-layered with lines on his own gandharvi and anandi models. 'Aarti (The Evening Ritual)' opens the album in evening mode with two extended introductory explorations of Puriya Kalyan raga. These sections, the alap and jor, open an Indian classical performance by elaborating and expounding the tonal framework. Debashish's touch at the outset is spacious; plucked notes are left to reverberate, ghostly harmonics echoing out atop a resolute drone. Ever so slowly the opening cadence crescendos, cascading into urgent eighth-note patterns. By the end of the track tremolo discord descends before a masterful guitar flourish to close. 'Ras Tarang (The Waves Of Desire)' is a Kirwani raga often associated with the midnight hour. This track is played on Debashish's gandharvi in a seven-beat time cycle. Gandharvas are the custodians of music and dance in ancient Hindu mythology. Skilled musicians themselves, the spirit of these Hindu devas is said to be found in the strong natural scents of bark, sap and blossom. The paired strings of the ghandarvi guitar ring out ethereally across the texture on this track creating a lingering, mysterious feel uncovering the central creative theme of desire. 'Mehfil-E-Jashn (The Celebratory Concert)' is in the Darbari Kanada, a late night-time raga which emphasises the instruments' lower tessitura and the modal lower tetrachord. Darbari Kanada is considered to hold a powerful emotional impact. It also possesses a respected royal history: it was popularized by Miyan Tansen, a sixteenth century composer in the court of Emperor Akbar. 'Roshni (The Light)' is a raga for burgeoning morning, the evanescent moment just before night recedes into dawn. Here Debashish treads a pensive, positive-sounding tonal world. On this track Debashish's musical debt to the legacy of Hawaiian lap-steel guitar playing can be profoundly heard in the shining guitar melody that bends and swoops above an empty texture, before tabla joins raising the tempo. The second half of the work is dance-like and celebratory in mood, building up to illuminate pulsing overlayed guitars, fluttering inimitable scalic runs and matchless melodic gymnastics. 'Vasundhara (Mother Earth)' breaks the dawn and rejoices in the coming of morning. Debashish opens with a boldly bluesy leitmotif. This track eschews the more meditative mood heard prior and launches headfirst into tight driving rhythmic propulsion. The textural contrast alludes to the sense of urgency at the start of a new day. As well as the Hawaiian influence, Debashish's previous work with Latin musicians resonates here; the dramatic instrumental interplay raises thoughts of flourishing flamenco guitar licks. Debashish dedicates this track to 'Mother Earth' and it is his peon to the environment, a cause for which he passionately campaigns. The album closes with a neat three-chord cadence and Debashish rests his case. I was speaking once with Debashish ji during the recording of this particular album, He was in Santa Cruz, CA. He was telling me about how important is the tabla playing in this kind of album where the artiste is trying to give the taste of different era's indian instrumental styles through his unique guitars. Subhasis has accompanied throughout the album employing Pakhawaji dhrupad style, to Varanasi poorav Baaj to Lucknow Farukhabad accompanying style, according to the raga style played on Slide guitar. This is..Subhasis. Most of the Indian Classical album doesn't allow a brief write up or the photo of the accompanying artiste, Tabla being most popular rhythm instrument from Hindustani music, I personally felt to write a few lines on Subhasis's apt accompaniment.. The album's brilliance owes a lot to magnificent tabla maestro Subhasis Bhattacharjee. One can feel the rhythm of time reverbating with each beat that Subhasis strikes with elan with his elder brother's glorious strokes and slides in each raga. The Kirwani sounds soft in Subhasis's hands in the seven beat time cycle. The beats get soaked in each note Debashish plays and a brighter cosmic sound emanates from Subhasis's playing of a broad-top tabla. As time settles deep into mid night the pensive Durbari Kanada surfaces with a deep rumbling to a wail and culminates into a sound of personal loss in the first piece. The same Durbari Kanada resounds into a magnificent celebration of the night. In Roshni based on raag Bhatiyaar a teental accompaniment (sixteen beat cycle) erupts blissfully. The balance of each syllable makes Subhasis's playing perfect to the mood of this morning raga. 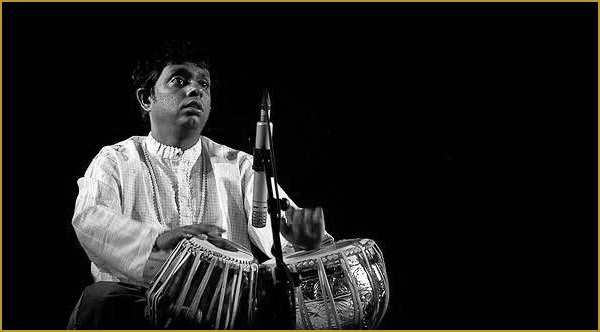 The depth of sound that Subhasis creates is sparkingly different from what is heard in contemporary Hindustani tabla playing. Any discerning listener can be swayed with the artistry as also any new listener to the form. This is where Subhasis excels. His brilliance in a lighter mood is poured in the last piece hailing the environment. Subhasis is not just an accompanist in this album but a perfect sound craft designer, as well as a Hindustani Musician. One of India's most inventive musicians returns to his roots. Two years ago, Debashish Bhattacharya demonstrated his global influences with Beyond the Ragasphere, a fusion set that featured dobro star Jerry Douglas and guitar hero John McLaughlin. Now he shows off his solo skills with a series of lengthy instrumental pieces (five tracks totalling 75 minutes), performed on slide guitars; drones and sympathetic strings are added to match the sound of the sitar, with occasional tabla percussion backing. The album title may not sound inspiring, but it's accurate. Ragas are linked to different times of the day, and this virtuoso set starts with an evening raga that begins slowly and gradually builds to a rapid-fire climax, and ends with a morning raga in which he re-explores those global influences, adding Hawaiian guitar styles, blues and flamenco to the mix. A tranquil and then exhilarating musical meditation.